Any New Pipe Smokers Lurking Out There? - Free Stuff! I've been blessed by all the kindness shown me on this site so I thought I'd cull the herd and give a few away. 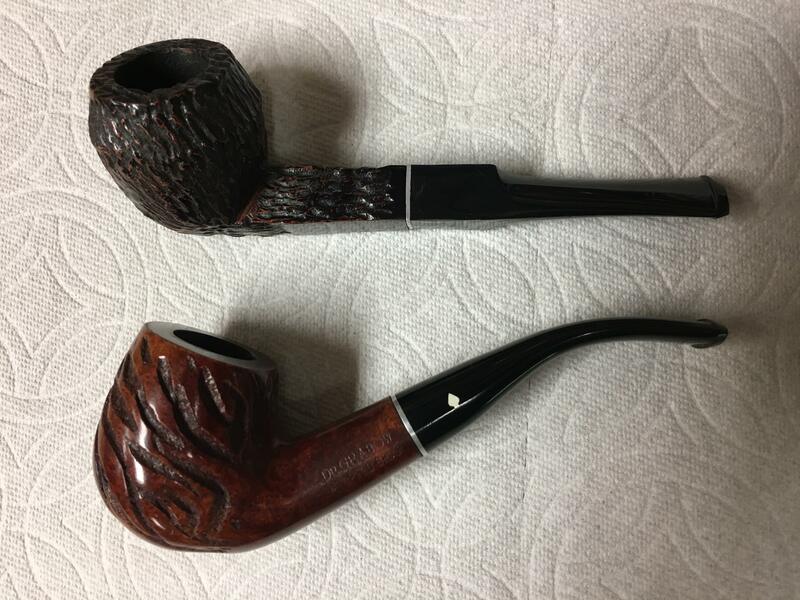 First pair up is a Grabow bent and a rusticated Thermofilter. Both are very lightly smoked. I'll throw in a few oz's of H&H Chatham Manor and some John Bull for a little variety...shipping on me. Brother, these are a coupla fine lookin' pipes! Here's hopin' a newbie takes you up on this great offer. Great gesture, wonder how long this will take to lure someone in. Free stuff gone! My neighbor came over while I was having a pipe this afternoon; he's a cig smoker but wants to quit via the pipe transition...can't think of a better candidate! I did give him a couple of conditions tho; give back if he doesn't follow thru so I can give 'em to someone else, and join the forum! I have the pipe smokers equivalent to the Benjamin Button thing, and I am slowly reverting into a newbie.. does that count?